The Rover RZT 34 zero turn mower has a reliable 452cc Rover OHV Engine, giving you added durability and a 5 year domestic warranty for added peace of mind. 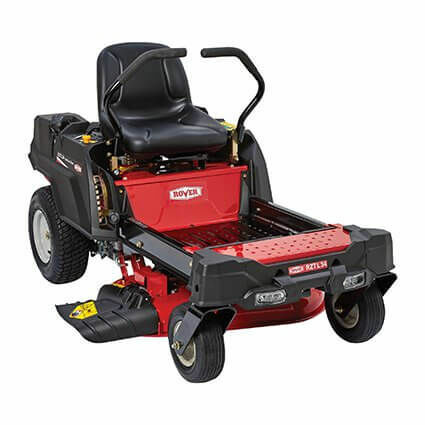 The RZT 34 features Dual EZT Transmissions for a smooth ride, front lights, 2-way adjustable lap bars for a superior maneuverability and an 86cm (34") side disharge cutting deck, making it ideal for mowing medium sized outdoor areas. The narrow width of the RZT 34 is an additional strength as at 34" it can fit through most standard sized side gates and takes up little storage space. The maximum width including grass shoot is 90cm (36"). The RZT 34 can be fitted with an optional mulch kit and catcher. Lombard 12 month Interest free $78.83 per week or $341.58 per month, Conditions apply. Visit Our Store822 Howitt St, Ballarat, Vic, 3350.